Allie Reid Arnold and Jonathan Howard were married June 23, 2018 in a 6:00 evening ceremony held at Danclay Farms with Gavin McGee and Steele Myrick officiating. The reception followed at Danclay Farms. The bride is the daughter of Anthony and Alice Arnold of Florence. She is the granddaughter of Butch and Martha Atkinson and the late Carl and Katherine Arnold, all of Florence. The groom is the son of Marlena Howard of Rogersville and Barry Howard of Lexington. He is the grandson of Ray and Betty Goodman of Rogersville and Hubert and Becky Howard of Lexington. 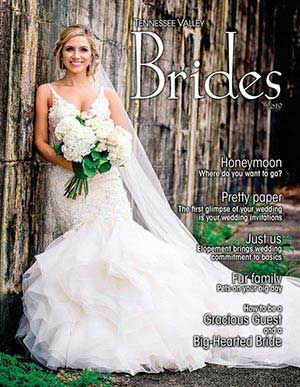 The bride chose a designer, princess ball gown from The Something Blue Shoppe that was a stunning combination of structured lace bodice and a voluptuous tiered ballgown skirt of dreamy tulle over Royal organza. A belt of crystals and rhinestones encircled her waist. The back featured a row of delicate crystal buttons. Her Royal veil of tulle was edged in beads and was held by a floral lace and crystal bandeau. The gown carried a chapel length train. Maid of honor was Sloane Myrick, cousin of the bride, and matron of honor was Heather Greuter, friend of the bride. Bridesmaids were Emma Clark, friend of the bride; MaKayla Miller and Piper Goodman, cousins of the groom; and Sara Howard, sister-in-law of the groom. Flower girl was Kylie Greuter, friend of the bride. Best man was groom’s brother, Josh Howard. Groomsmen were Kord Greuter, Jesse Dison, John Nelson, Nick Surratt, and Sam Blalock, all friends of the groom; and Alex Goodman, cousin of the groom. Usher was Brandon Howard. Ring bearers were Ryan Eckl and Jon Eckl, cousins of the bride. Wedding director was Donna Pigg. Floral designer was Will and Dees Florist, and caterer was Jill Larkin of Jill’s Sweet Memories, who also made the wedding and groom’s cakes. Ceremony music was performed by Alyssa Butler and en- tertaining guests at the reception was the band Bama Border and balloon artists Ricky and Camille Hicks. Hair stylist was Mellany Lancaster and make-up artist was Layla Howard, both of Revelationz Studio. Photographer was Megan Dawson of Dawson’s Photography and videographer was EJ Almon and Jacob Pittman of EA Productions. Other special helpers were guest book attendants Teresa Hanback and Hannah Staggs; shuttle drivers Cory Darby, Jerry Edwards, Beezer Blalock, and Roy Pigg. For their honeymoon, the couple took a cruise out of Mobile, Ala. to Costa Maya and Cozumel, Mexico. They are now residing in Florence.